a Pesto and a Hummus, twisted | "Il faut goûter"
Seems I’ve been eating a lot of green lately, in the form of smooth green spreads slathered on breads. Does that sound appetizing? It should! 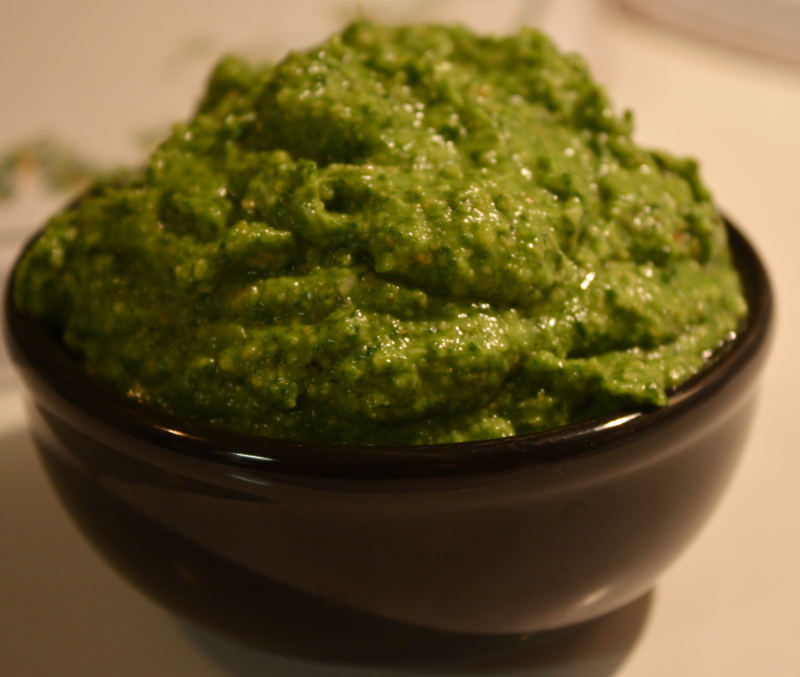 First, a genius Spinach-Cashew Pesto adapted from Joy the Baker. I’ve made this four times in two weeks, and had many requests for the recipe! Joy served this atop a fancy-sliced baked potato, which I tried, following her recipe here. 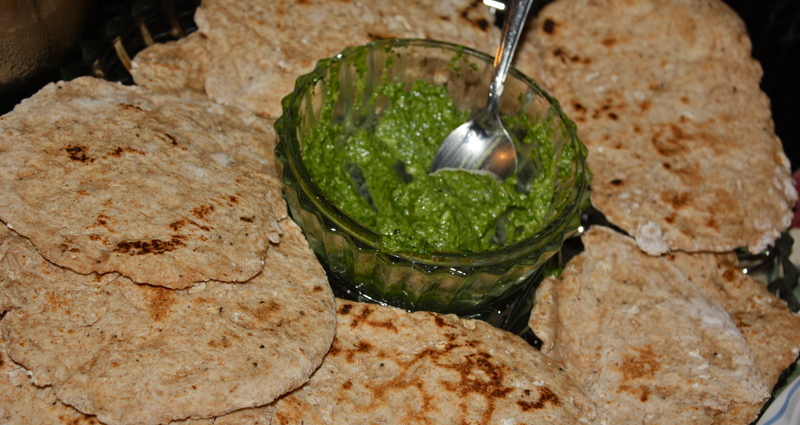 It was very pretty and pretty yummy, but I found that I prefer this pesto on flat bread as an appetizer. This bright green lemony-garlicky concoction definitely deserves to be the center of attention…and it will be great in the winter, when fresh basil isn’t abundant! Place garlic cloves, spinach, nuts, lemon juice, lemon zest and Parmesan cheese in the bowl of a food processor. Blend until spinach is broken down and, while still blending, slowly pour in the olive oil and blend until smooth. Taste and add salt and pepper as needed. Serve with your favorite bread as an appetizer (or over pasta or potatoes)! Next, a twist on classic hummus. 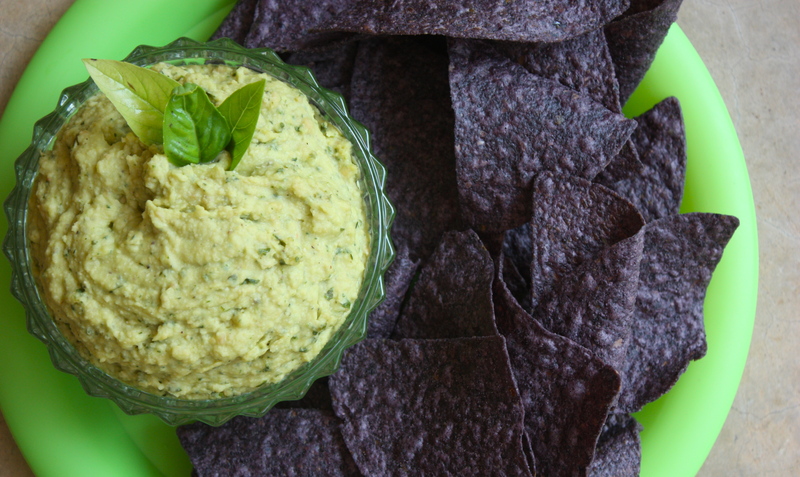 Lemon and basil marry beautifully in this green-tinted hummus. Serve it with bread or tortilla chips, or as a sandwich spread. Put chickpeas, cashews, zest, lemon juice, garlic and basil in a food processor. Pulse until everything begins to break down. Add olive oil slowly and pulse until smooth. Add salt and pepper to taste. If the hummus is too thick for your liking, add a bit more olive oil. This entry was posted in Savory and tagged basil hummus, food, recipe, spinach cashew pesto, spinach pesto, summer dip, summer spread by needtotaste. Bookmark the permalink. Ok, I’m loving your blog already. The recipes and the photos both look fantastic.